The boat feels empty this morning, as the fourth set of friends have just left. Some cruisers say that they really discourage people from coming to visit, as it puts them on schedules that they don't like to have to keep. We're the opposite. We LOVE to have our friends come visit. And yes, it does sometimes mean sailing when we otherwise wouldn't, just to get to an airport somewhere, but as far as we're concerned, half the fun of cruising is sharing it with our dear families and friends! Anyway, if it weren't for all the visitors, we might never raise the anchor and go anywhere! Island time, you know, mon. And all that innnnnerrrrrrtiaaaaa. Jon's dad, Colin, was our first visitor to Ocelot, but we can't claim that he was cruising with us. 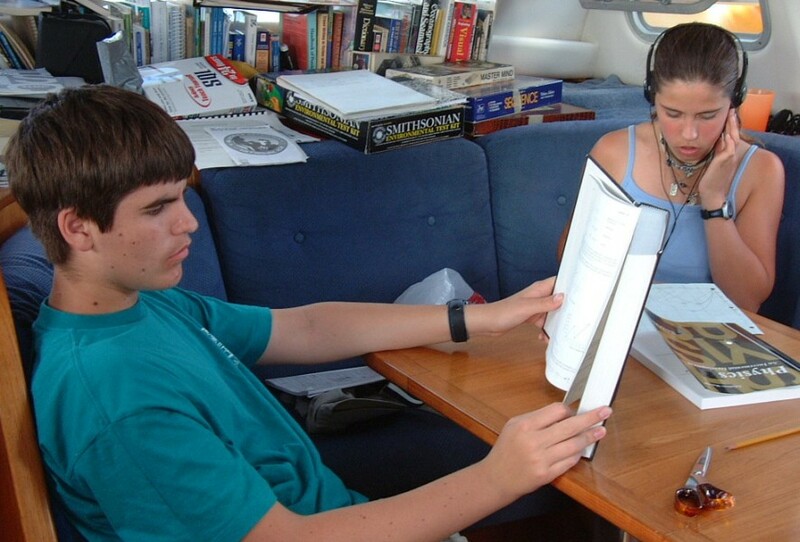 He wonderfully came to help set up systems, electronic and otherwise, on the boat, but we never took him out sailing. With Karen and Jon we began to feel like cruisers, hopping from one anchorage to another, checking out the snorkeling and beach walks. After seeing the gross build-up of casinos and hotels and traffic in St. Martin, it was wonderful to find sleepy Anguilla still sleepy and lovely, with only a couple other cruising boats at some anchorages, and the water still deliciously clear. Our short visit with the Harshbargers (all 5 of them!) was a whirlwind of activity as we re-traced our route with Karen and Jon, now knowing the best snorkeling places and the whole customs/immigration routine for Anguilla and St. Martin. Unfortunately, a norther blew in, with big swells and heavy Trade Winds (25 and up) and that made the northern St. Martin and Anguilla anchorages untenable, so we had to tuck back into the Lagoon for the last couple nights. They were good spirited about it, though, realizing that the weather will do what the weather wants, despite our plans. 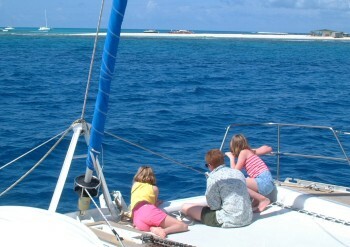 So, here we are again, tucked up into the Lagoon, enjoying friends and shopping. Still trying to beat this ex-charter boat into a cruising home. I guess I haven't entirely left the hustle bustle of the Northwest behind, as I feel like the time with friends is a sort of vacation, and the rest of the time (throwing hundreds of dollars at the marine chandlery) is "normal." I hope this changes. Cause we sure didn't come down here to replay our life up north. Jon is as focused and busy from sun-up to sun-down as when he commuted off to work. Granted, it's on island time -- meaning he has to walk everywhere, or wait for little local buses playing reggae inspirational music, or he has to return to the same places over and over and over waiting for work to be done or parts to come in -- and if we look at what we're really accomplishing, it's surprisingly little compared to what we could do in the States. Perhaps we are, after all, slowing down. We took a "field trip" to Marigot last week with 3 other American kids (one actually Russian) and 2 Aussie kids. Along with parents we climbed to the fort above town, and explored the history museum learning about the early settlers (Arawaks and Caribs) and then the European settlements and the introduction of slaves for the sugar plantations. 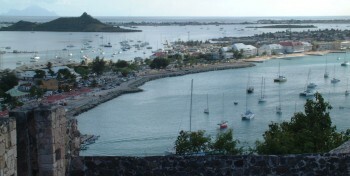 Marigot and Simpson Lagoon, seen from Fort Louis. Saba is just visible in the upper left. My plans to formally teach French are failing and I feel guilty sometimes, but then I love how Chris speaks to the French waiters and waitresses, and can read museum signs pretty accurately. He enjoys helping people figure out how to pronounce those crazy French words with all the silent letters! Amanda is very reluctant to learn French, preferring instead to study her Spanish book on her own. I think she doesn't want to confuse the two languages, and I'm not much of an example, as I often tell stories of my own combining French and Spanish in one sentence and not even realizing it! It's great to see so many cruising kids here -- given that in 1984 there was ONE kid, a 9-year-old, in the whole of the St. Martin anchorage! When he left, two more arrived. Period. Now there are a few dozen, of all ages. We tend to spend the most time with families that are still on the move, (like we will be), and less with those who are working ashore. We've been in St. Martin for almost 4 months now. Life has speeded up a bit as we prepare to leave to head south in a couple days to meet friends down island. It's 6 pm and the sun is still hot, though low in the west. Chris, Jon and Amanda have all gone off in the dinghy (family car) to join other teens and parents for a swim at a beach nearby. The cat, Arthur, and I are enjoying the evening breeze, and a Beach Boys CD. But the oven is on, creating a mini-climate in the boat of over 85 degrees, so the sweat is pooling on eyebrows. The lasagna is due to come out in about 45 minutes, at which time I expect Jon and Chris and Amanda to be back and lining up for showers under the sun-shower. If I finish this mini-missive, I'll have had my shower and be ready for the Aussie family of 4 who are coming to dinner. We Hackings have had dinner alone once in the past 6 days. Sometimes just extended drinks and snacks on someone's boat after swimming or passing by after shopping. Sometimes a planned get-together, often on our boat, because we're the 'party boat', with the most space (which we love, and we anticipated, after a similar experience on our last boat). On Easter Sunday we hosted a potluck brunch aboard Ocelot, with 8 kids (mostly teens), and 7 adults. Luckily it didn't rain, so we were all over the deck, cockpit and below. Food highlights were French cheeses, Russian caviar and a chocolate dolphin. So, how do we meet all these friends? For starters, St. Maarten is a cross-roads of the Caribbean, and we've run into long-ago friends who we worked with in the 1980s. Also bumped into Carolyn Bailey, the woman who was aboard Oriental Lady when we bought her in 1981, and who now lives in Nova Scotia with husband and daughter (Amanda's age). Carolyn and Lexi are in St. Maarten for 5 months working on a charter catamaran owned by friends of theirs to escape the Canadian winter. As for new friends: we have to thank the kids for that. Boats with kids home in on each other like bees to nectar. The kids sit around in groups, all ages, talking about books, boats, pets aboard, etc etc, with conversations punctuated by laughter and impromptu songs. It must be very freeing, with no pre-conceived notions about anyone else -- just a gaggle of kids having fun. For the adults, total strangers become friends in a matter of hours as sailing stories are swapped and conversations turn to cultures, economics, politics, and common travels--be it in S. America, Africa, India, or the Caribbean. It's still a small world, this mini-world of cruisers, even though our numbers have expanded ten fold since the 1980's. Just last night we met a family who are 5 years into cruising from Australia to the Caribbean via the Red Sea: and we find out they are friends with our Aussie buddies in Airlie Beach, Queensland. I've been ashore 3 times today running errands: making phone calls to family, businesses, and shopping. I'm still tracking down $3500 that was swindled from us and many others in a big insurance scam here on the island in January. Also tracking down insurance on a shattered solar panel that should have been resolved two months ago. The islands seem to attract not only those wishing to escape from the rat-race, but those that plot to take advantage of the rest of us, and those who were losers in the US or Europe. It's not the islanders: but the ex-patriots (AKA patri-outs) that you have to watch out for! The wind was up today, blowing at over 20 knots, which means white caps on the lagoon (think of a salty lake, about 2 miles by 3 miles), and very sloppy dinghy rides. Since we take a laptop ashore for email, we have to be careful to keep it from getting wet. And since the lagoon is polluted, we try to keep ourselves from getting wet as well! Every stop, be it at the chandlery, international phone (on a dock), local phone (1/4 mile away on another dock), or the email center, is highlighted by short conversations with fellow cruisers and good-humored islanders. I have turned down 3 offers for a beer or cool drink in the course of the day, and have had to decline climbing aboard several boats. If we weren't trying to leave St. Martin in the next couple days, I would have accepted all invitations and accomplished about 1/4 what I did. Such is life in the fast lane. More later. Time to shower and prep the boat for dinner guests.